I was asked to judge at the Art Olympics in the Granite School District. I was blown away with the talent and the skill level. 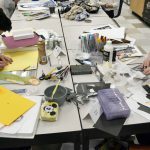 At this event, the students had approximately 4 hours to produce a work of art. 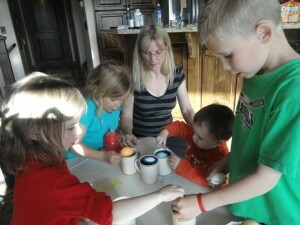 There were potters, painters, sculptures and mixed media. At this Olympics, I had the opportunity to speak to the artists and to interact with them. One of the ways to judge a piece of pottery is to see if the thickness is consistent. Is the thickness of the sides and bottom not to thin or too thick? The way you tell that is by cutting the pot in half. When I asked the students to cut their pot in half you could see their eyes widen. I remember the first time I cut my pot in half to see how I was doing as far as making my pots consistent. It was an absolutely ugly pot and I was still devastated that it had to be cut. 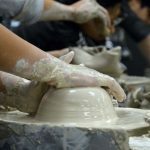 It takes years to get to the point that your pots are consistent. If they aren’t they could easily break when they are fired. Plus, it adds to its ascetic appearance. One of the hardest things about being an artist is feeling that you or your art is just not good enough. When a work of art is made it is from the heart and the sole. It is like a piece of you. What if someone doesn’t like it???? I used to live in Pittsburgh, and I wanted to make a pot that portrayed the city skyline. After giving it much thought I finally decided to throw a tall pot with just a little rounding at the belly. I tried throwing this pot at least 3 times before I finally got the shape I wanted. Then I had to let it dry until it was leather hard. After that I started carving some of the majestic and historic buildings you find in that big city. Day after day I carved; step-by-step it started taking on the historic cityscape. That was exciting to me. I felt it was breath taking and I hadn’t even fired it yet. It was finally ready for the first firing. It came out of the kiln looking just as I had planned. Even that step seemed to be a miracle. I planned to do a Raku firing for the second time around. That is when you take the very hot pot out of the kiln and put it into a combustion chamber filled with shredded newspaper. The paper catches on fire because of the very hot pot. I then put a lid on it in which it starves the fire of oxygen. This makes fire licks on the pot or it can make white crackle glaze have black cracking lines all over it. So, with building excitement and enthusiasm I put the glazed pot into the kiln. When It reached temperature, I turned the kiln off and opened it to remove my pot to the combustion chamber. 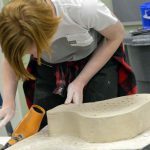 During that process, I hit the tip of my pot in the edge of the kiln and brock off the top part of one of the historic buildings. I was devastated. It was supposed to be ready to put up for auction at an art gallery. Now all I had to enter was a broken pot. After three days of crying I decided that I only had too choices to make. 1- I could choose to never do art again because I am not good enough to even get it through the firing. Or 2- I could choose to move forward. I decided to go ahead and enter it into the auction. I renamed it “Broken Tear” in part because of all the tears I cried to create it and it had not turned out the way I wanted it to. The amazing thing about that pot is that it sold for around 3 times more than any pot I had sold previously. The reason being that the person that bought it had lived in Pittsburg most of their life and had seen beautiful historic buildings being laid to rest. That pot touched her heart to the very core. Broken Tears. Life doesn’t always turn out as we plan it, yet in all of this mess, the learning and the broken tears, there is something magical. The biggest lesson taken from this incident is that we are good enough right where we are. Yes, there is a lot of learning to still take place AND we are still good enough right where we are. Take life one-step at a time; believe in yourself; share what or who you are and love the growing times. It feels so good to see so many young people sharing their talents and to believe enough in themselves that they will produce and share their creative talents. The students I spent time with that day were extra ordinary. Keep up the amazing work. We read so many beautiful stories in the scriptures, especially regarding women. One such story is of Tabitha, a woman with perfect passion. She did not fear her destiny, nor did she question if she was even good enough, but she lived a life of service, never concerned if she was capable or lacking in any way. She just served. Tabitha or Dorcas seems to have been a well-off widow living in Joppa. 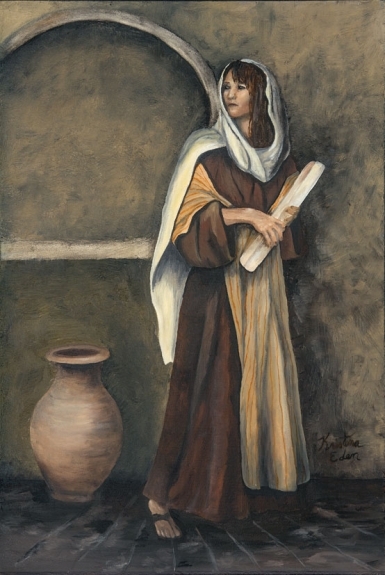 The Greeks referred to her as “mathetria,” meaning female disciple. This word was not used lightly in the New Testament. She was known as a Holy Women of good repute and spent her time doing good works and “acts of charity.” She was so loved and essential to helping her community, even her name indicates a woman of grace, beauty and energy. No fear just service. 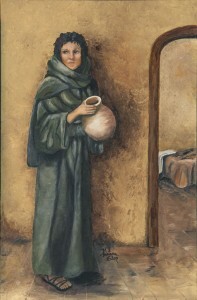 She herself was without a husband yet she looked after the marginalized. She made clothing for those without, she watched over the fatherless and widows. In fact, her type of service was needed so desperately that Peter raised her from the dead. How does this relate to you? What were women expect to do at her time? How did she do her job and still take care of her family? Was she criticized for doing or being something others believed was not justified to do because she was a women? It may not be our calling in life to do such a thing as Tabitha, yet we do have a purpose in life that is much greater than ourselves. We can follow that purpose and live it with passion. So how do we do that? How can we be like Tabitha? Let’s start with our feelings of not being good enough. That by itself can give us doubt about our ability’s to fulfill our callings in life. That alone can prevent us from having passion to reach and fulfill our destiny. We live in a world where we feel pressure to always be the best at everything. The best wife, friend, role model, mommy, neighbor- you name it, we should be the best at it, right? NO! That isn’t even humanly possible. Let that idea go. 1- Recognize where this thought is coming from. Is this coming from our true self or the outside world? Just noticing will make us more self-aware of what we need to change. Self-reflection of us, not social media, or magazines or Hollywood. We need to focus on what is inside of us, not on our appearance, or our property, or what we don’t have. 2- Pressure from our selves. What we think determines how we feel and how we act. Does that sound too simple? Change one negative thought at a time. 3- Comparison is our greatest enemy. We live in a society with invisible markers that tell us what we should do or become. When we compare ourselves to others, it is from our worst struggle to their best show. We feel we should be already perfect or already have reached our potential. Do not compare yourself. 4- Be true to yourself. Be honest. Take the time to know what you really want to do and who you really are. Sometimes we have to dig deep. The outside influences in life are just fluff after you know who you are. 5- Realize that all people struggle with something. We just can’t see it. We need to take the time to see others as who they really are. It is easier to just love them for the truth, not what they appear to be to us. We are all of great value. 6- Focus on what you have to offer. This is the biggest of all the keys. Where you place your focus is where you find your passion. Tabitha did what she could with what she had and what she was doing. She magnified her calling, but did not follow a path that was expected of women at the time. Tabitha just followed her destiny. She cared about her people and about her God. She showed her love by giving her time and labor. She is the kind of a person that is needed in our world today. We need more people who are passionate about what they do. We need people that just care and do it with passion. You are good enough. Our passion may not even be noticed or accepted by those whom we help. They may turn us away in-spite of our efforts. Whatever we do to reach out may be shunned or unappreciated. We need to keep the passion alive anyway. We can return good for evil. Be passionate as Mother Teresa wrote: “Give the world the best you have, and it may never be enough. Give the best you’ve got anyway. You see, in the final analysis it is between you and God, it was never between you and them anyway. The good you do today, people will forget tomorrow, do good anyway. And might I add, do it with passion, you do have what is needed and you are good enough. You are needed for who you are and for where you are. I often look at the wondrous natural phenomena in the world around us and wish that I could capture and keep them forever; so my attempt to do so is revealed in my painting of Monument Valley. Monument Valley is a breath-taking masterpiece, a place of wonder, a place of beauty and of peace that is similar to being bathed in warmth on a very cold day, or like a cool breeze in the blast of the sun’s rays. 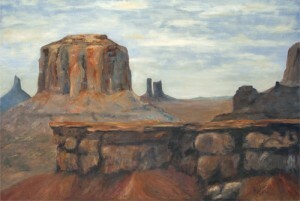 According to the Navajo legends, the giant mitten-shaped buttes fit the hands of the gods. Have you ever visited a place that seemed like God’s playground? When you are there it is like playing in the playground of the gods with a deep conviction that you are safe with sentinels at the gate to protect and to teach. Monument Valley is so immense and intricate; a “Master Artist” must have built it. Would it not be nice to take that peace and ambiance with us daily? How do we accomplish that? I have learned that peace really does not come from outside of us, but from within. Those moments when we feel the peace, is when our heart is open to receive new life and hope. 1- Interpretation- this may seem a bit strange. How does interpretation bring peace? Early explorers of Monument Valley felt the rocks seemed to be on fire smothering every living thing. Today, it is considered one of the wonders of the world. This same scenario applies in our lives daily. For example, when family members say something rude, we feel bad, but are they trying to be mean? What is our interpretation? We could be angry and lose our peace or we could choose to see their perspective. Were they having a bad day or do they lack the skill to communicate? We cannot know all that is going on in their heads or hearts. We do have the choice of finding peace by looking for understanding instead of taking offense. 2- Perfection – When I become a perfect artist or when I become a perfect mother, then I will find peace. Does that sound familiar? In reality we are here on this world to learn. Are we born being a perfect artist? No!!! We learn to paint one step at a time, one principle at a time. We learn to see what is in the world one day at a time. It is the same with whatever role we play in life. We learn how to reach our potential one day and one step at a time. Do we ever obtain perfection? Maybe not. Yet if we look back, we see our own great accomplishments. Learn to feel peace in the progress. Our lives are not easy. Life is not meant to be easy. Some of us have been given struggles that appear insurmountable; and some of us have more struggles than others; yet we build with what we have. And we do so one step at a time, one day at a time. Look for the peace in our struggles, and then be open. Line upon line, one-step at a time become the Master Artist of your life. At times I feel a little lost in reaching my personal dreams. Even on good days when I work, I love; I move forward in the right direction, and I still wonder if I have accomplished what I need to do. My dreams at times feel miles away even after evaluating, redirecting and continually working toward them. In making this Raku jar I visualize capturing those hopes, goals, and dreams and have them stored by my bed ready to emerge when I awake. Is your jar filled with dreams waiting for you? I read a humorous story by Steven Pressfield and a muse. The principle taught was very strong and applicable. Steven Pressfield wrote a blog called: You, as the Muse Sees You. He shares his vision of how creativity and inspiration work: his Muse flies over the world daily with a jar of fabulous ideas, looking for people who have shown up. He is looking for people who are ready to work. If you are sitting at your desk ready to work or warming up ready to run, the Muse will see you from up high reach in her jar and toss down an idea to you. If the Muse flies over your house day after day and each time you are procrastinating or avoiding what you are meant to do, eventually she gives up and doesn’t stop by anymore. I do believe this principle to be true. It would be nice if a muse really delivered it, but I look at this as inspiration coming from our higher source. Wouldn’t you like it if your accomplished dreams were just handed to you in a jar? What would it be like to be able to achieve your greatest goals when all you had to do was get out your piece of paper and write them down, in detail? How do we make that happen? That is an overpowering question. Make a dream list: We have all heard this one before. When the dream is written down it is more likely to be achieved. Write the dream in detail. Believe in self, ignoring deterring opinions: This area can be hard; life can pull us in so many different directions. It is important that we know who we are and what our purpose is. We may not know exactly how it will all play out. We do need to understand ourselves enough to take the first step. Our life goals are not to live other people’s dreams; we are aspiring to our own dreams. It is good to help others achieve also and they may be headed in the same direction as we are. Yes, I have friends who walk the same paths with me; which makes our dreams worth living. Yet it is important to realize the great things that we alone are here to achieve. Acknowledge barriers: This one can take a lifetime of learning. To be the best we can be at what we are meant to be, we need to continually learn and continually share what we have learned. Explained simply, the 20 Mile March cites the example of the divergence in strategy between the explorers Roald Amundsen and Robert Falcon Scott, in their efforts to lead their teams to be the first to the South Pole in October 1911. These two teams took different approaches to achieve their goals. One chose to march 20 miles everyday no matter what the conditions. On good days they marched only 20 miles. In bad conditions they still marched 20 miles. Day after day they kept the pace. Because of this strategy they made their goals where as the other team perished in the wilderness. If we are taking the next step, we will be assisted. If we are procrastinating, our assistance will also be procrastinated. Take the first step and take the next step. Don’t wait for that inspiration, it will come. Each day, be consistent. Start again and again; take one step, then the next. 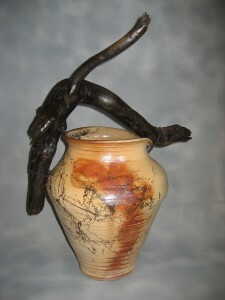 I made this Raku jar to represent all of our dreams being caught and stored ready for us to use. The driftwood on the top is a signal that we are moving step by step onward and upward. The heart of our dreams and our ability to achieve them are a beautiful thing. Our dreams are there for us. They are waiting for just us. Take these dreams and embrace them; carry them with you in all your daily living. Carry them with you in all the steps required to move them forward. It will start to feel as if your dreams are being tossed down to you. Neurologists at St. Michael’s Hospital in Toronto found that artists suffering from vascular dementia may still be able to draw spontaneously and from memory, despite being unable to complete simple, everyday tasks. “We discovered that there is a disproportion between the degree that artists lose some of their memory function, their orientation and other day-to-day cognitive functions. But at the same time, some of their art form is preserved,” Dr. Luis Fornazzari, a neurological consultant at St. Michael’s Hospital memory clinic and lead author of the paper, told CBC News. Artists compared with non-artists are better protected, he added. “Due to their art, the brain is better protected [against] diseases like Alzheimer’s, vascular dementia, and even strokes. They have more reserve in their brain in order to give functions. 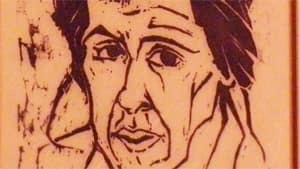 “Mary Hecht was a remarkable example of how artistic abilities are preserved in spite of the degeneration of the brain and a loss in the more mundane, day-to-day memory functions,” Fornazzari said. But she could quickly sketch an accurate portrait of a research student from the hospital’s memory clinic. 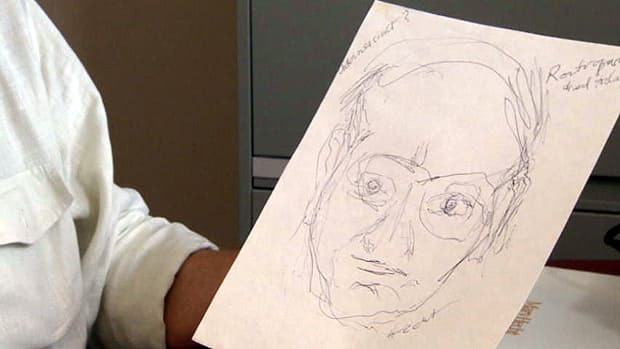 She could also draw a free-hand sketch of a lying Buddha figurine and reproduce it from memory a few minutes later — as well as an accurate sketch of famed cellist Mstislav Rostropovich after learning of his death earlier on the radio. “This is the most exceptional example of the degree of preservation of artistic skills we’ve seen in our clinic,” said Dr. Corinne Fischer, director at the St. Michael’s Hospital memory clinic. “Most of the other studies that have been done in this area looked at other kinds of dementia such as Alzheimer’s disease or frontal temporal dementia, while this is a case of cognitive reserve in a patient with fairly advanced vascular dementia,” she added. Fornazzari told CBC that details from previous cases of patients suffering from Alzheimer’s disease, including one musician who could still play the piano and learn new music, were also included in the study. In a separate study in 2011, Fischer also looked at bilingual patients with Alzheimer’s and discovered they had twice as much cognitive reserve as their counterparts who only spoke one language. Does that even sound like a possibility? To this day I cannot remember what she had gotten into but I do remember those huge sparkly eyes so full of life and mischief. How can you not just love her? 1. One street you want to block is to make sure that children do not feel entitled. Have you been around people who feel they can do what ever they want to people or things with no regard for other’s feelings- an actual belief that the universe turns around them? Not pleasant nor reality. 2. Another street to be aware of in disciplining is to not crush the beautiful sprit inside. So how do you teach a child to be respectful and still maintain that spark? Disciplining with love! That isn’t even an oxymoron. All of the sudden I had notice that one of my kids was missing; the quiet one of course. I hurried up and down the isles. I checked the candy lane and the toy lane. I’d even check the bathrooms even though I knew she wouldn’t go on her own. I started noticing the people around me wondering if they would have possibly taken my little child. Have you ever been to that point where sheer exhaustion and pure panic set in? I wanted to start screaming. Where are you? I asked the clerks and the store managers and everyone was watching for my little girl. About a half hour had passed and the manager decided to call the police because in the news there had been the devastating story’s of young children being taken. What is the first thought that comes to your mind? Do you forget that just a moment ago you were so frustrated because of the commotion the kids were causing? Do you feel remorse for not watching them so close. More than likely you are just too concerned for the safety of your child that all thought of yourself is gone. After the frantic search and the tears we finally found the sleeping child. In the end she had just crawled under the rack of children’s cloths and gone to sleep. Yet at that moment before you were completely out of yourself and just loving that child. Then there were the hugs and tears and paying for the food, which I am sure I had no idea, even what was in the basket. On the ride home I told the kids that we needed to come up with a better way to go shopping. So together we made up our list of rules for shopping day. I wanted them to be invested in this with me so that we would not repeat what we had just done. So together we made our new rules. 1- No running from mom. 2- Pay attention to the people around you. 3- Write a grocery list together before we go. 5- Watch out for each other. 6- Only pick one thing to put in the cart. Now those may sound like little trivial things yet when you look at the bigger picture these teach empathy, awareness, money management, consideration, and safety. What a simple idea and yet still so profound. Because the kids helped come up with the ideas, they were more willing to follow through. I also love my grandchildren. 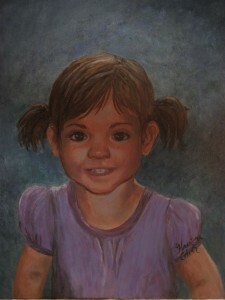 The following is a painting I did of Reese my granddaughter. I caught her getting into something, which I can’t even remember what that was, but her expression was so captivating. In the painting she was just 2 years old. Now she has grown into such a beautiful 6 year old with that same spark in her eye. I really can’t take the credit for her becoming such an amazing person, because she is so like her mother- empathetic, considerate, loving and so talented. Coming out soon, I have a read aloud children’s book that helps parents and children through daily living to believe in them selves. “Do you believe in me?” Watch for it. When life gets hard, it seems that it’s the arts that are the first to be put on the back burner. We have a tendency to think that they are a luxury that we can’t afford. In my own life, I have seen peace and meaning being manifest in me, in my work, in my children, and in their work from their exposure to the arts. Even though they have not chosen to be artists, per se, I see what the influence itself has given them. An article by Dee Dickenson really hit home for me. It mentions some real reasons we so desperately need the arts in our lives. • They are languages that all people speak that cut across racial, cultural, social, educational, and economic barriers and enhance cultural appreciation and awareness. • They provide opportunities for self-expression, bringing the inner world into the outer world of concrete reality. • They develop both independence and collaboration. • They make it possible to use personal strengths in meaningful ways and to bridge into understanding sometimes difficult abstractions through these strengths. • They improve academic achievement — enhancing test scores, attitudes, social skills, critical and creative thinking. • They provide the means for every student to learn. How could we pass up an opportunity to give the world so much? I challenge you to use the arts of any kind to enhance your world. Encourage it in others, enjoy it for yourself, and help find a way to provide for it in schools, society, and homes.